Luxury, sunny 1 bedroom apartment with large panoramic roof terrace. Our beautifully appointed romantic and very comfortable apartment in the Dorsoduro area of Venice offers an intimate and perfect location from which to explore this magical city. It boasts a stunning panoramic roof terrace, overlooking the Giudecca, with a table and chairs as well as deck chairs to relax on. The rooms are bright and airy with windows on both sides of the building offering lovely views to gardens below, which is unusual for Venetian apartments. The accommodation comprises a double bedroom with very comfortable king size bed and fitted wardrobes. Bathroom with shower, loo, bidet and large wash hand basin. Fully equipped kitchen. Large sitting / dining room with sofa bed, Wi-Fi internet, SKY satellite TV, I-pod speaker dock, DVD player and music system with CD. The apartment has air conditioning and full central heating. There is a washing machine, iron and hair dryer. Our apartment is available for weekly rents or by the night for a minimum of 3 nights. Guided Tours: Depending on availability we can arrange guided tours of Venice with an English speaking guide Please contact me for details. Wonderful location and beautiful apartment with rooftop deck for enjoying amazing views. This is really a unique and magical place to stay in this breathtaking city. The accommodations were top notch. Wonderful lighting and comfortable breezes through out . The area where it’s located is very convenient to markets, restaurants and Campos to enjoy relaxing and experiencing the true nature of Venice. I plan to retire and when I do this will be my first choice for a place to stay. This charming , romantic apartment is immaculate and well appointed with everything we could hope for in a home away from home. It was such a happy experience to stay here. Quality furnishings throughout. The roof top deck is such a delightful bonus and a great spot to unwind with a spritz while watching the sun go down. Two steps to the boat stop and the top notch Conad market. The owners and their onsite host were wonderful to talk to and always accessible. The Dorsodoro neighborhood is always our first choice when staying in Venice. Away from the crowds, beautiful views, and plenty of lovely restaurants. This apartment is gem. A totally sublime Venetian home from home! Increasingly, the "problem" with Venice is how to enjoy the whole unique experience without being swamped by the crowds. One option is to stay somewhere further afield, but that very often means depriving yourself of the real feel of the city, particularly once the day visitors have departed. Another solution is to stay in this gem of an apartment in Western Dorsoduro - even before you go up onto the serene roof-terrace you realise you are somewhere very special, surrounded by the Guidecca canal at the front, with other canals on two sides, all full of life, colour and buzz. The rooftop terrace is the icing on the cake - at eye level with several beautiful church towers (Carmini, Angelo Raffaelo and San Sebastiano for example), plus a unique panorama of Venetian rooftops as far as the eye can see. The apartment itself is well equipped and furnished with taste, with bags of room for all your belongings. If it's hot and sunny, it's light and airy, if it's raining, it's cosy! From the moment you turn into the narrow allyway leading to the street door, you are entering a zone of peace after the bustle! The location is ideal - literally 100m to the very well served San Basilio vaporetto stop, or less than 5/10 minutes to Santa Margherita/San Barnaba. A supermarket on the Zattere before you even reach San Basilio is stocked with everything from basics to high-end deli. For a unique experience, put this apartment at the top of your list - satisfaction guaranteed! Lovely apartment. Great location. Well equipped. Excellent communication and information from the owner. The apartment is ideal for a couple. It is in a lovely area, within walking distance of all attractions, and has a water stop within 150 metres, if you need transport. There is a well stocked food store 100 metres from the apartment and there are numerous restaurants within close proximity. 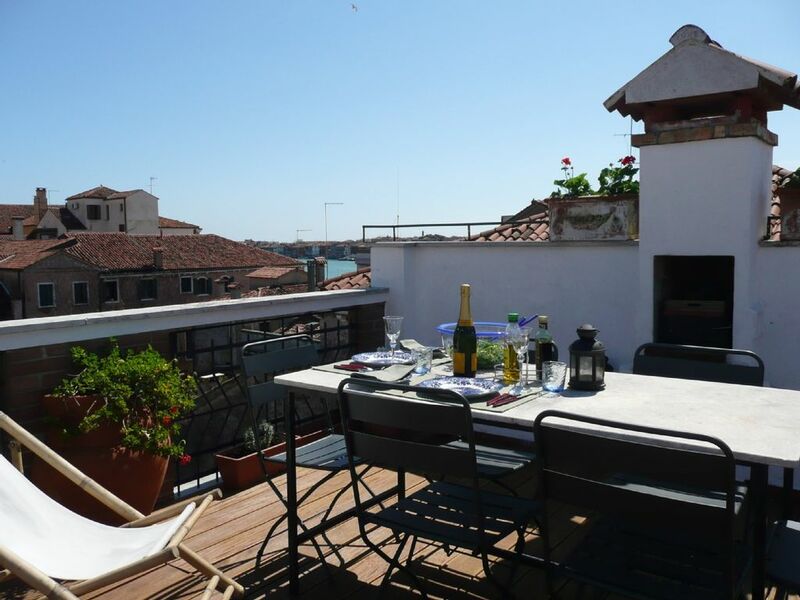 Lovely roof terrace with views to the Guidecca Canal. There are a number of stairs leading to the apartment. I only mention this if you have mobility issues. Warm and comfortable and ideally situated. We stayed at this appartment for 5 nights over New Year. Having arrived from Florence by train we took a water taxi to the appartment which I highly recommend as it is the only way to arrive: breath taking! The appartment is very well located, with easy access to water buses , Conad supermarket, restaurants and within easy walking distance to all key sights in Venice. There are stairs upto the appartment, which are narrow in places, but this was not an issue for us, as it meant the appartment was high above the rooftops with great views of the city. We were met by Mara on arrival who was very welcoming and so helpful. The appartment was well presented with light decor and furnishings.The double bed (not king size) was comfortable with good quality linen, and the bedroom had plenty of storage space. The kitchen was well equipped, but we were surprised there was no microwave. As it was winter when we visited we did not enjoy the benefit of the roof top terrace which provided an additional dining /relaxing area for warmer nights, and very private. A washing machine is also located on the roof terrace which was greatly appreciated by us, although there was no evidence of a drying rack within the appartment only an external line out of one of the window, which , with the wintery conditions, made drying a little difficult. Despite the cold weather the appartment was very warm and peaceful. Lovely apartment and excellent locale!!! Quiet, well appointed spot near water buses, steps from great grocery store, easy walking to major sights, good eateries. Great communication with owner, Helen, and Mara was tremendously gracious letting us in late. Only complaint for a late October visit was the mosquitos. Would highly recommend to friends. Our apartment is located in the Dorsoduro area of Venice beside The Zattere. The nearest waterbus stop is San Basilio which is 1 minute walk away. Piazzale Roma (bus station) and Venice train station are 20 minutes walk or 15 minutes by the No. 2 waterbus. St Marks square is 20 minutes walk and the Accademia is only 10 minutes with the Peggy Gugenheim just close by as well. There are many restaurants nearby along the Zattere, our favourite being the Ristorante Riviera is just 1 minute outside the flat. 10 minutes walk is the lively Campo Santa Margherita where there are many restaurants and bars as well as daily fruit and vegetable stalls and some excellent fish stalls. Conveniently there is an excellent and well stocked supermarket called Billa just 1 minute walk away. Beside the supermarket there is a post office and also cash machine. Please note these rates are quoted for 2 people sharing. If the sofabed is required then there is an additional charge of £20 (GB pounds) per night or £100 (GB pounds) per week.